Alaskan Malamutes will win you over with their playful, outgoing dispositions. They greet everyone as a friend — even strangers and first-time houseguests — so they don't make good watchdogs, but they are extremely loyal to their family and friends. Malamutes can learn to get along with other dogs and indoor cats. 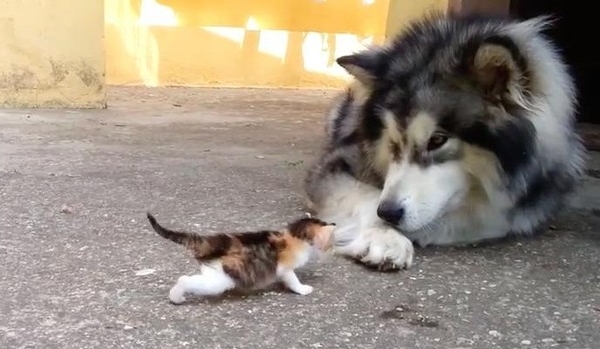 Responses to "Alaskan Malamute Has The Best Reaction To Meeting Tiny Orphaned Kitten "
The dog is gorgeous and responds so cute to the kitten. I am such a fan of the wolves and this dog looks like one. So he or she won me over instantly!